This class which is appropriate for beginner to advanced students focuses on gaining a deep understanding of painting techniques using sources that may include still life, portraiture, figure painting and landscape. 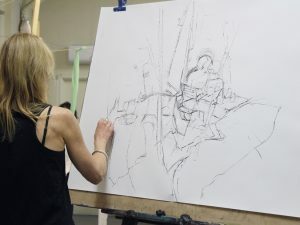 Using reference images, studio set ups and life models, students will learn about a wide range of important techniques that include colour mixing, paint properties, the use of mediums and composition while developing the ability to render expressive realism. Taught by Ignacio Rojas who specializes in Alla Prima painting and is a highly regarded and passionate artist and art educator.